Rana Creek, teamed with Granite Construction and Kleinfelder, is responsible for habitat restoration design and implementation for California’s largest dam removal project. This watershed restoration encompasses 62 acres and nine different habitat zones, from wetland, to riparian, to upland. Planting design considers proposed slope, aspect, soil hydrology and microclimate to correspond to appropriate biological communities including oak woodland, mixed chapparal, sage scrub, rock slope, alder + willow, cottonwood + sycamore, mixed woodland, littoral and wetland basins. Rana Creek Nursery prepared 80,000 container plants, 10,000 live willow stakes, and locally collected seed mixes for planting in fall of 2015. Rana Creek designed a temporary irrigation system which considered local climatic and evapotranspiration data, soils, flood elevations, and anticipated water demand for establishment. Riparian and wetland areas will receive spray irrigation, while a drip system is specified for upland trees, utilizing diverted water stored in a temporary detention pond. Rana Creek will conduct five years of monitoring and maintenance for this important project that will restore unimpaired access to spawning steelhead, improve habitat for the threatened California red-legged frog, restore the river’s natural sediment flow, and reduce beach erosion and destabilization. The San Clemente Dam was an old behemoth built more than 90 years ago, 18 miles from the coast of the Monterey Bay atop the Carmel River. Its purpose was to provide municipal water to the Monterey Peninsula, but an unintended consequence—true for most major dams—was its impact on the river’s ecology and surrounding landscape. The rivers of California, and all around the planet, play critical roles for the Earth that many people may not give much consideration. One is their part in flushing the land’s discarded sediments out through waterways, which help to form countless miles of riparian habitat, before flowing into the ocean and accumulating along coastlines, where they reinforce beaches. Another is their role as nutrient “conveyor belts,” in the words of University of Washington Professor David Montgomery at the opening of a short film entitled Remove the Dams to Save the Salmon? He explains that open waterways allow salmon to spawn as tiny fish upriver before swimming out into the ocean, where they grow to full size, and then finally returning to their respective rivers. That eventual homecoming—what’s known as a fish run—is a critical delivery system, allowing proteins consumed by salmon in the open ocean to move back up into the land, inevitably becoming food for bugs, birds, coyotes, and trees, and fertilizing the Earth by rippling up the food chain. So when, in 2015, the San Clemente Dam was deconstructed and removed, it was celebrated as an opportunity for the 36-mile river to return to its natural state and hopefully yield an uptick in its dwindling salmon and endangered steelhead trout populations. The $83 million removal project, which included an innovative river re-routing, was lead by the California State Coastal Conservancy (CSCC) and represents the largest dam removal in California history to date. The removal frees up 25 miles of fish spawning habitat and opens the river channel for fish to swim up and down as their life cycle intended. Though it’s too soon to say with scientific certainty, Tommy Williams, a fish biologist with the National Oceanic and Atmospheric Administration (NOAA), says that the fish spawning rates appear to be increasing, and that the entire river system is bouncing back much faster than he could have anticipated. “Rivers are very complex things—there are backwaters, eddies, shallows, pools, runs, ripples, gravel flowing, boulders,” he enthuses. “They’re very, very dynamic systems. These fish are taking advantage of all that diversity, and many fish use the habitat differently. That “messiness,” he says, is what makes all of a river’s beautiful life possible. In defiance of big rivers’ messy, free-flowing, life-inducing tendencies, dams oversimplify the natural waterways—so much so that the same caliber of biodiversity, especially for fish, becomes impossible. “By simplifying them, we’ve controlled the variability, and by controlling their variability, we’ve reduced fish’s ability to move around and persist,” Williams says. The San Clemente Dam and its rural reservoir, located in the foothills of the Santa Lucia Mountain Range, was once a crucial water resource (and water scarcity continues to pose a threat on the Monterey Peninsula). But due to safety concerns, the dam was decommissioned in 2002. Approximately 95 percent of the reservoir’s storage capacity had become filled with sediment, pushed along by the river before corking up behind the towering wall of concrete. According to experts, an earthquake or heavy storm—like was seen last winter—could have caused the dam to fail, which would have likely sent thousands of tons of river mud and muck flowing into the Carmel Valley and its communities. This posed a complex engineering hurdle for the dam removal project, Williams says. 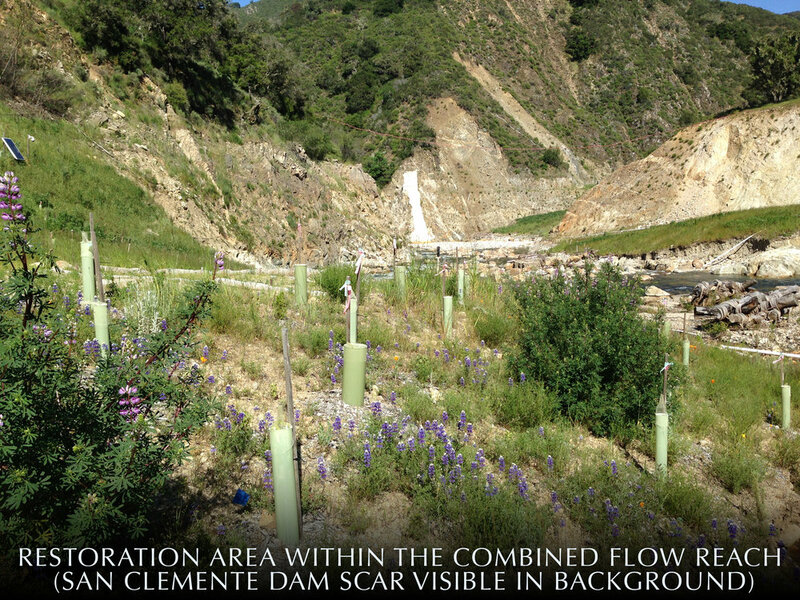 In order to manage such a massive amount of backlogged sediment, the CSCC developed a channel through a nearby ridge to reroute a half-mile portion of the Carmel River into the adjacent San Clemente Creek, where they used the abandoned reach as a sediment storage area. The river re-route allowed the engineers to create a safe passage for fish around the sediment mass during its relocation. The Carmel River and the San Clemente Creek have a confluence not too far above the old dam site, where they both flowed into the reservoir. While the San Clemente Dam Removal Project did return the river to its natural state, at least one dam-removal expert took issue with some aspects of the plan. “I’ve been both a supporter of removing San Clemente Dam and also a critic of the project design they employed,” says Matt Stoecker, a biologist and producer of the award-winning film DamNation. Stoecker, who grew up in the Santa Cruz Mountains, learned to trout fish while staying at his family’s cabin on the San Clemente Creek, upstream from the former dam. Stoecker is critical of the re-route strategy, which he says reduced the natural length of the Carmel River mainstream by half a mile and its habitats, demolished part an oak-studded ridge line, and failed to utilize the accumulated reservoir sediment as a resource for restoring the downstream river channel and feeding beaches in the Monterey Bay. He says we know more now than we did a decade ago about “the seriousness of sea-level rise, and fact that dams trapping sediment is putting our coastlines at greater risk” by not allowing it to flow out through our country’s rivers. Stoecker believes it is still feasible for stakeholders to update the plan and utilize the sediment, metering it out down the river over the years. “Dam removal—with controlled sediment mobilization and progressive flood-protection measures—is one of the most effective ways in which we can replenish, expand, and protect our coasts,” he says. The CSCC chose to store the sediment in the excavated channel due to concerns that letting it flow out through river could worsen flooding conditions downstream. Across the West Coast, more than 200 dams are becoming backlogged with sediment and potentially eligible for removal, which would mean major revitalization for the nation’s rivers. While the implications of dam removals on fish spawning are not fully realized yet (we must wait up to 15 years for real data, explains Williams), the prospect for deconstruction is increasing. “We are seeing more dam removals with time, and bigger and bigger systems are being removed,” says Jonathan Warrick, a Santa Cruz-based researcher for the United States Geological Survey who specializes in sediment movements and the intersection of rivers and the sea. Warrick worked on the largest dam removal in Washington State in 2011, the Elwha Dam, which resulted in a spectacular comeback of the Elwha River, its surrounding landscape and the native fauna.